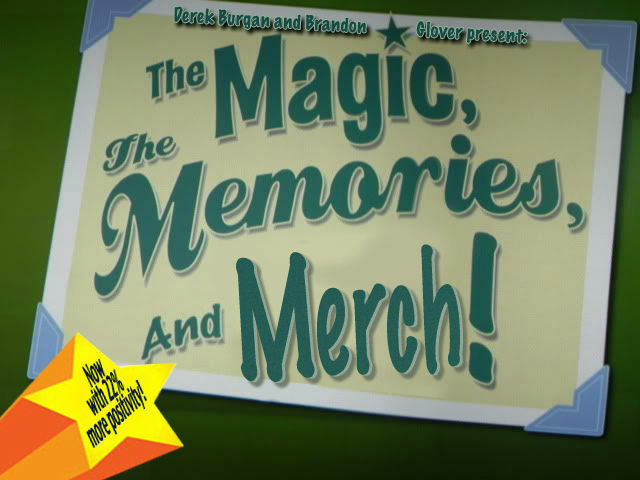 Welcome to the latest edition of The Magic, The Memories, and Merch! the longest running monthly look at the Disney Outlet Stores in Orlando. November means we say goodbye to EPCOT’s Food & Wine – and surprisingly the “Burgy” Award winning Canadian Lumberjacks – but hello to the Osborne Family Spectacle of Dancing Lights and Mickey’s Very Mery Christmas Party. Hope you had a great Thanksgiving, and while you were digesting all that turkey (or Tofurky) did you happen to notice there was a special edition of the SATURDAY SIX looking at what we theme park fans should give thanks for? Even better, this past weekend was also time for the Second Annual Theme Park Turkeys of the Year. Did your favorite make the list? Fear not, while you were out on Black Friday ripping items out of the hands of kids , Outlet Intern Julia Mascardo and I were hard at work to bring you the Outlet coverage you expect deserve! Enough jibber jabber! 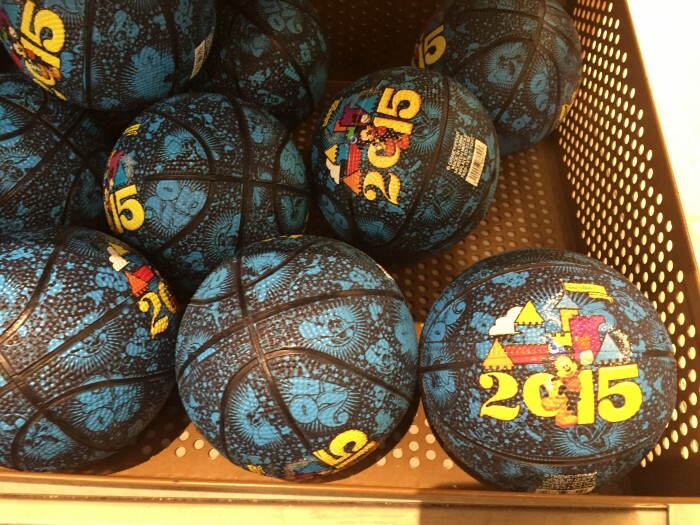 Who is ready to hit the Outlets? Remember that clicking on any picture will open a full size version of it (don’t say we didn’t warn you). 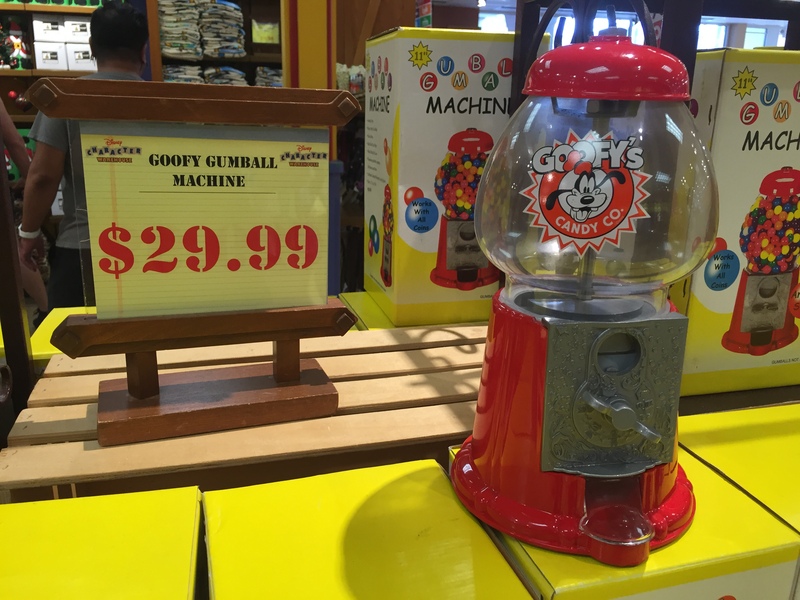 First up is a Goofy’s Candy Company Gumball Machine. Who doesn’t like a gumball machine? It’s unAmerican not to! 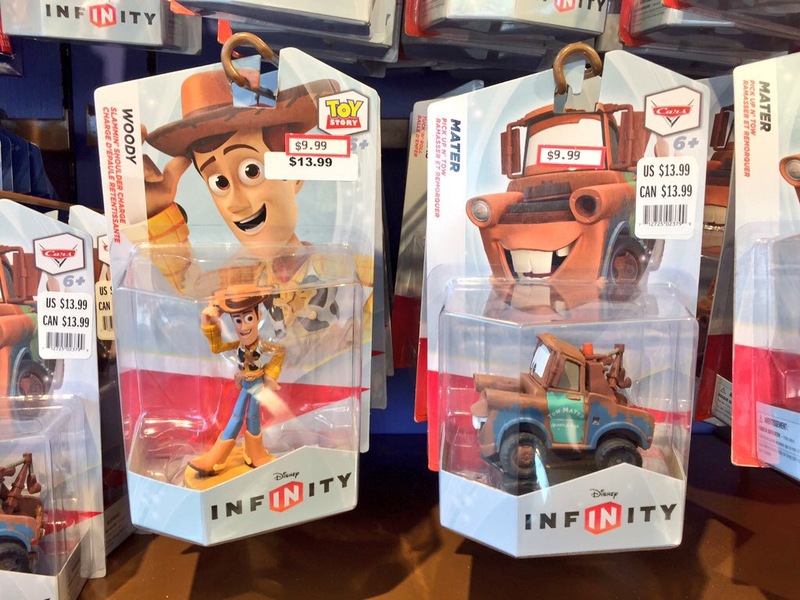 For the first time EVER, Disney Infinity items were reduced for clearance at the Outlet. There had occasionally been a Disney Infinity figure here or there for sale, but always at full price. 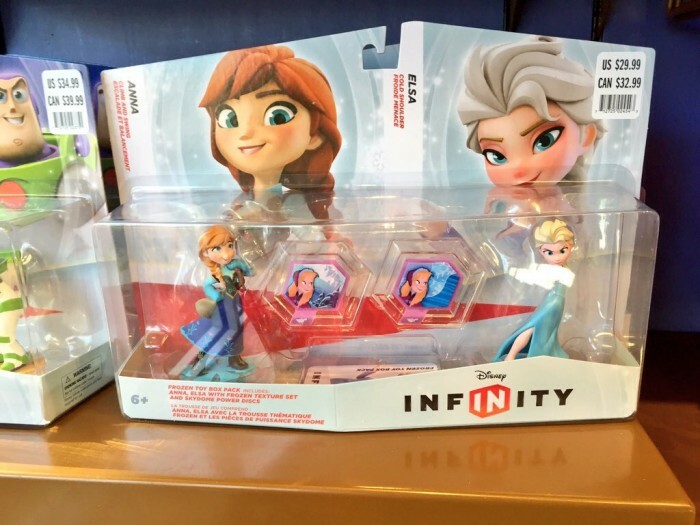 This month had a slew of figures marked down, including everyone’s favorite Frozen sisters reduced to $14.99. 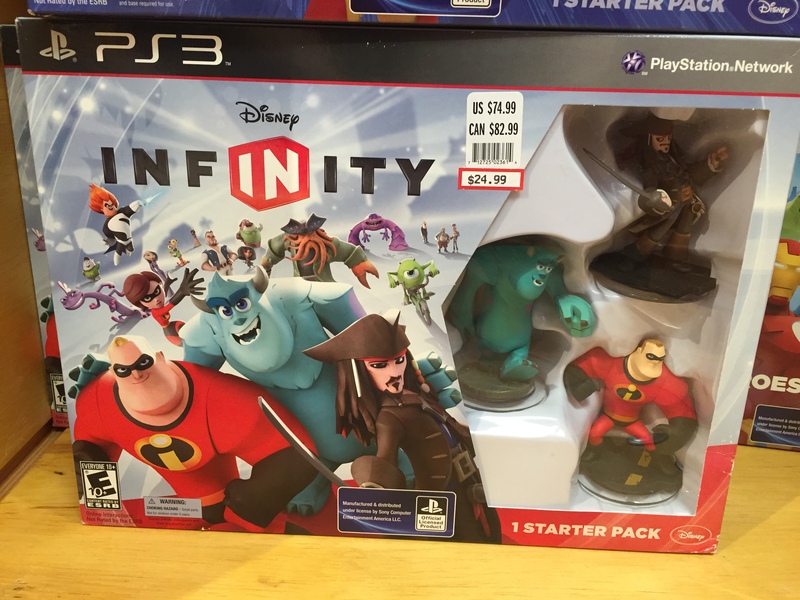 While I’ll never play Disney Infinity, I absolute LOVE the art style of these characters and was hoping to see them for cheap one day to start picking them up. 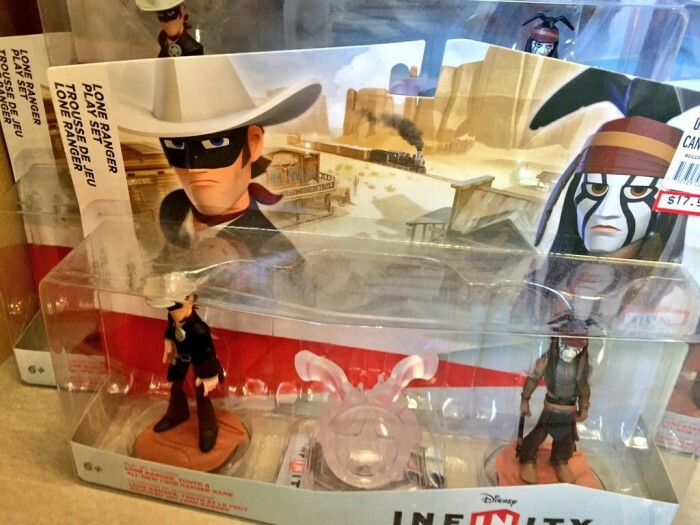 Even this Lone Ranger set looks pretty sharp. Here’s a couple Pixar Pals. 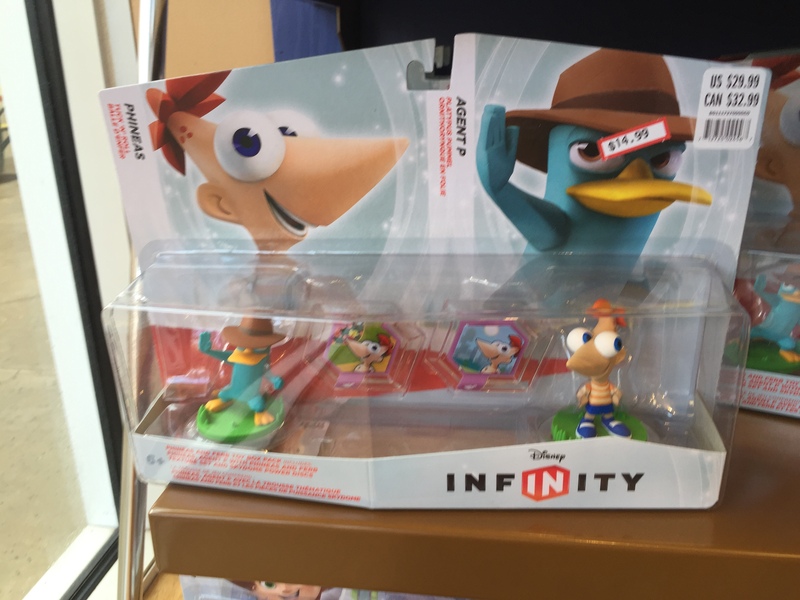 Phineas and Agent P from Phineas and Ferb. 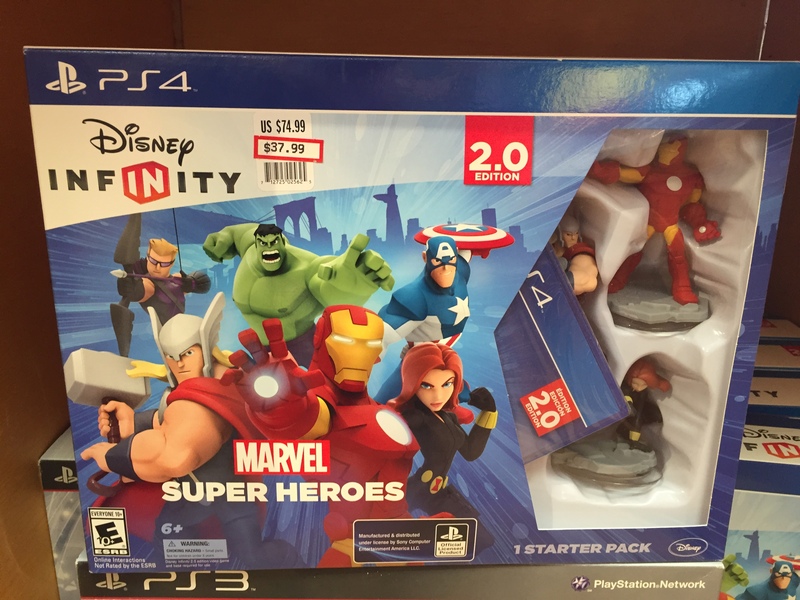 The playsets themselves were also massively discounted, including this Disney Infinity 1.0 version. 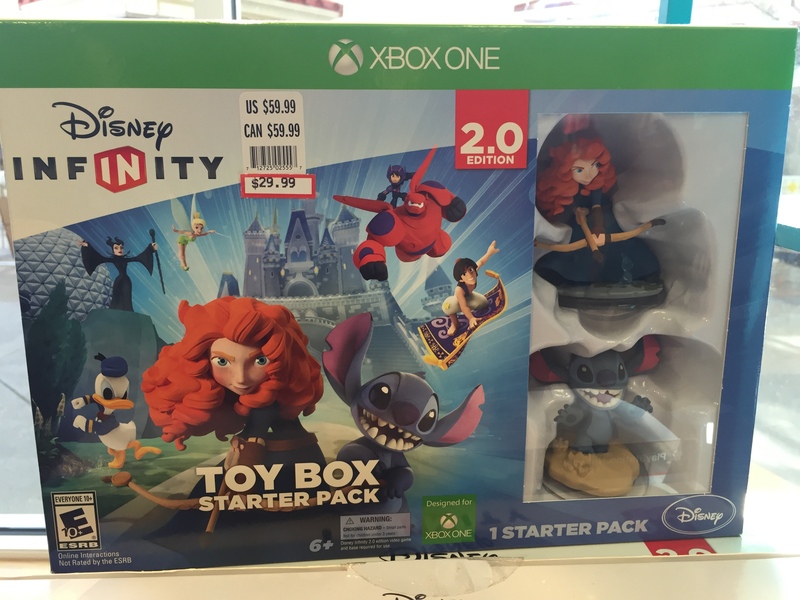 Here’s a Disney Infinity 2.0 set. This was the debut of the Marvel characters into the world of Disney Infinity. 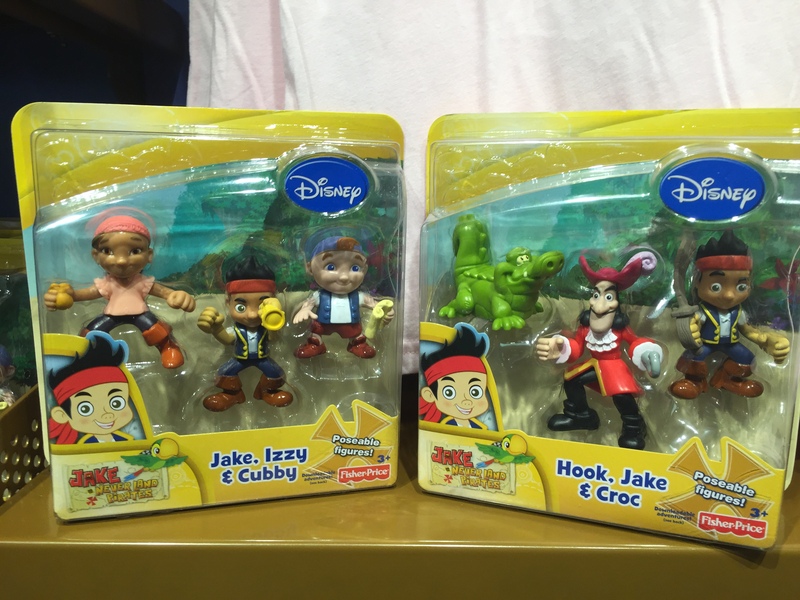 Jake and the Neverland Pirates are still pretty hot right now and it’s still rare to see a piece of Jake merch in the Outlets. 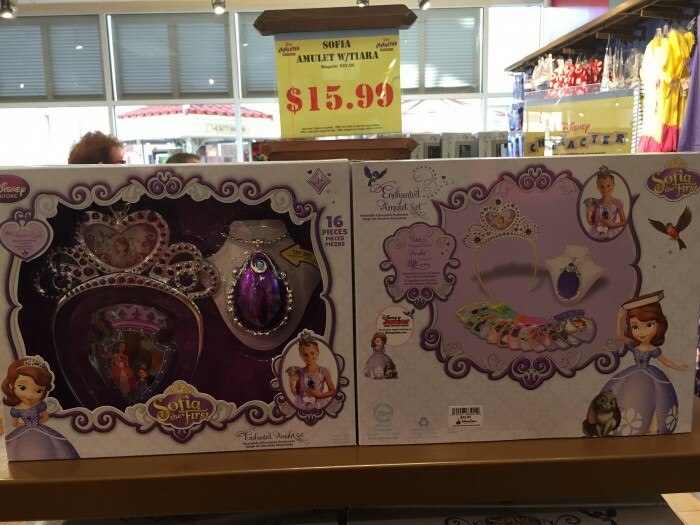 These toy sets were originally $13.95 marked down to $9.99. Did I purchase them? Well, here was our meeting of Jake in Disney’s Hollywood Studios just last week. What do you think? Jake and Izzy meet Jake. 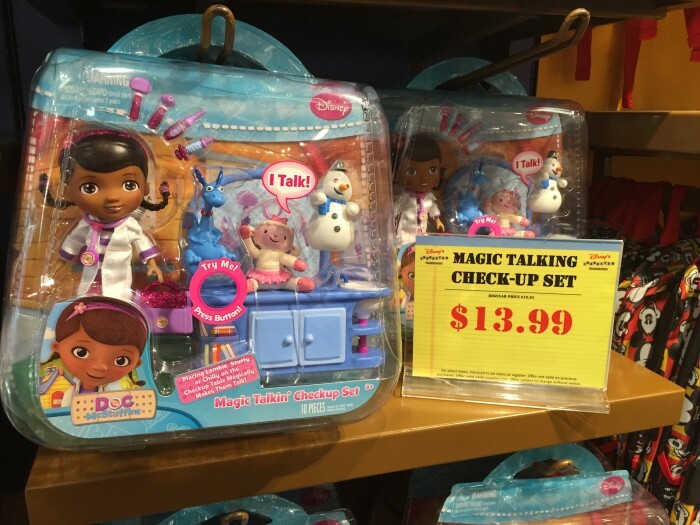 Another Disney Junior toy on sale was this Doc McStuffins check-up set. As well as this Sofia the First Amulet with Tiara combo. 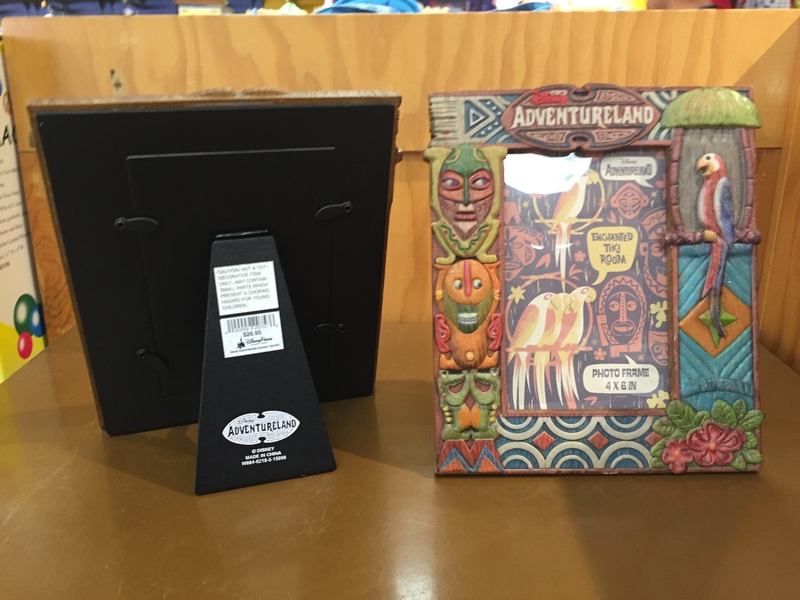 Time for some Adventureland stuff including this pretty sweet Enchanted Tiki Room frame. These Adventureland glasses were originally $12.95 marked down to $5.99. 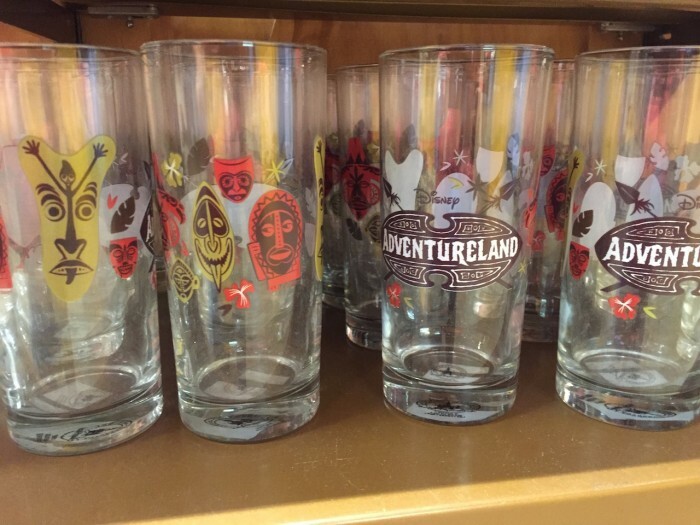 While these Adventureland Tiki cups were originally $16.95, reduced to $7.99. 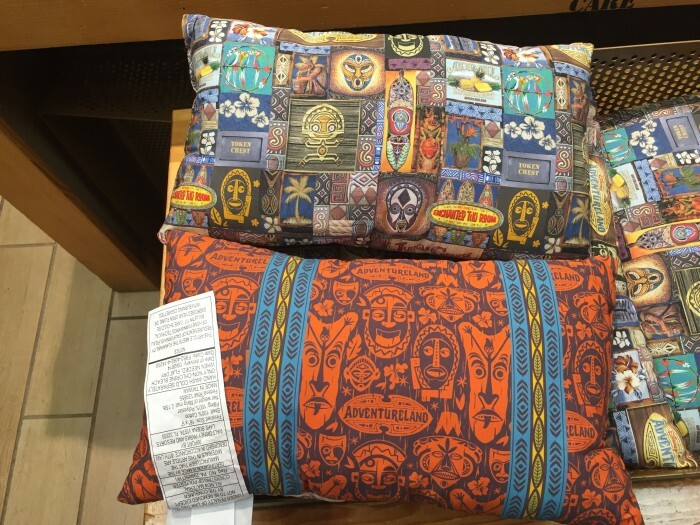 Adventureland pillows marked down to $9.99. 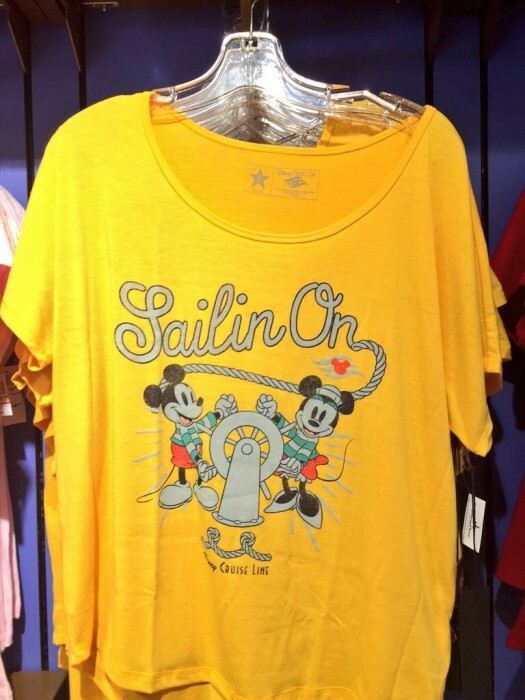 Always on top of things, Outlet Intern Julia has noticed that more than a couple of the items we have seen at the Outlets have shown up on Disney’s new shop at home app. Does this mean that physical clearance stores could be coming to an end? 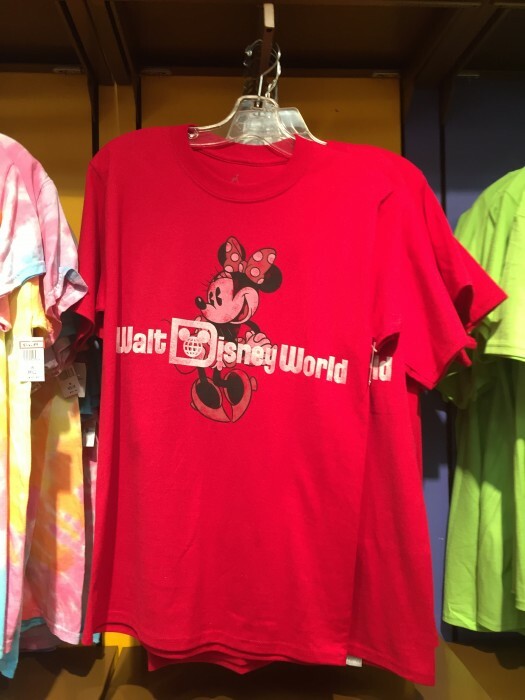 I guess it all depends on how well things sell on the app, but you have to think Disney is dreaming of the day not having to pay rent for a store or all the Cast Members to work there. 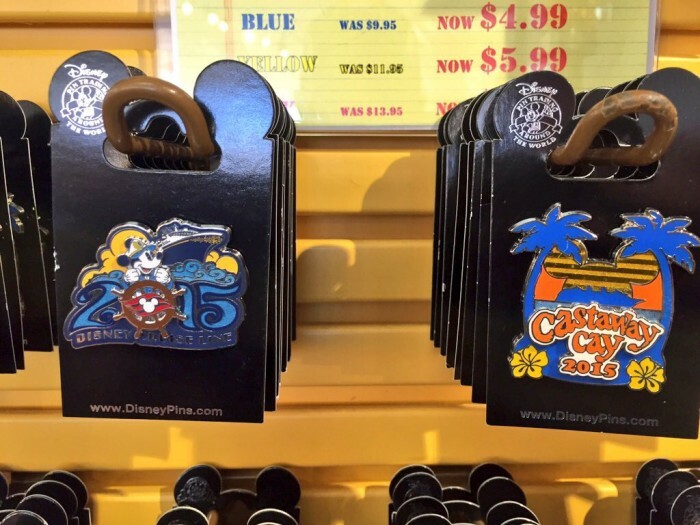 These Disney Cruise Line pins were originally $9.95, marked down to $4.99. I remember a while back we saw at the Outlets a weird Mickey head accessory that went on the front of sneakers and here is a perfect accompaniment for that: a pair of “wings” for the side of your shoes. 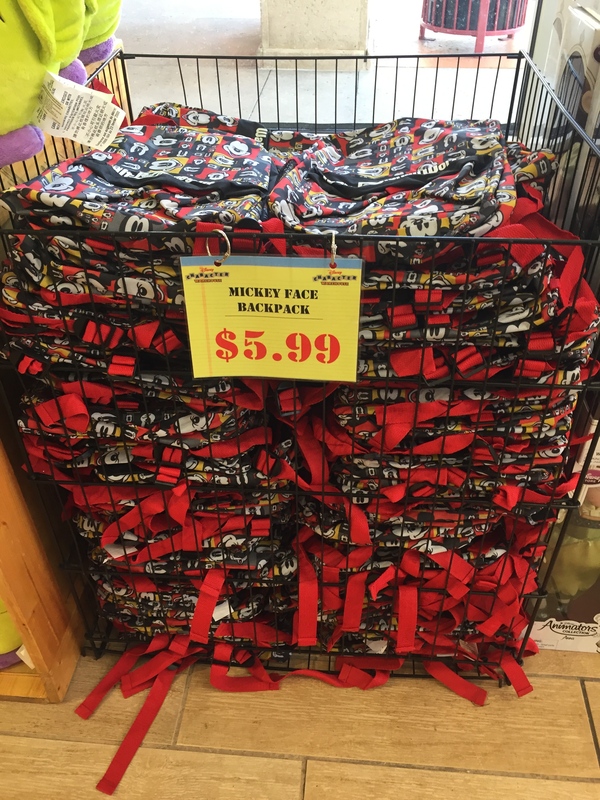 Originally $9.95 marked down to $4.99. 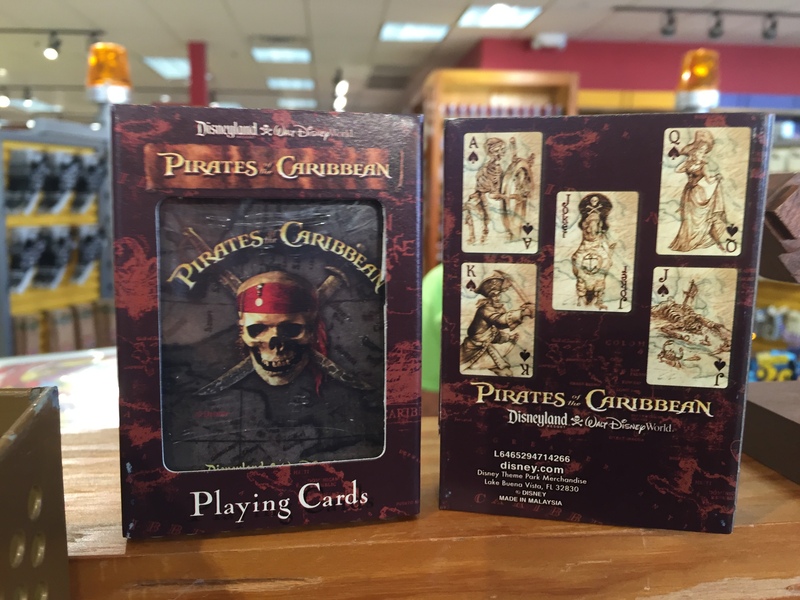 Here are Pirates of the Caribbean playing cards. Originally $6.95, marked down to $1.99. Pirates of the Caribbean playing cards. Unless you were in the store early however, you never got a chance to see these cards. Right after I took the picture, someone bought every single pack of cards they had in stock. Here you wonder why these Outlet trips drive me into a rage. Now, I’m not saying people like this should be brought to the town square and publicly whipped, but if the law passed I wouldn’t protest it. This was the person’s running total at the time. It went well over $1,000 by the time they were done thanks to adding on several handbags that were displayed behind the registers. Bags like this Dooney & Bourke Marathon Bag. Originally $248, this was marked down to $149.99. Bags like this are limited to 2 bags per day. 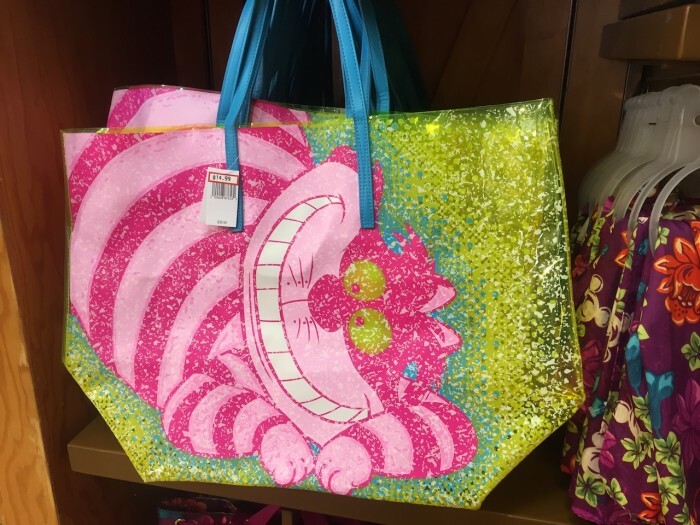 This Cheshire Cat bag was a more reasonable $39.95 marked down to $14.99. 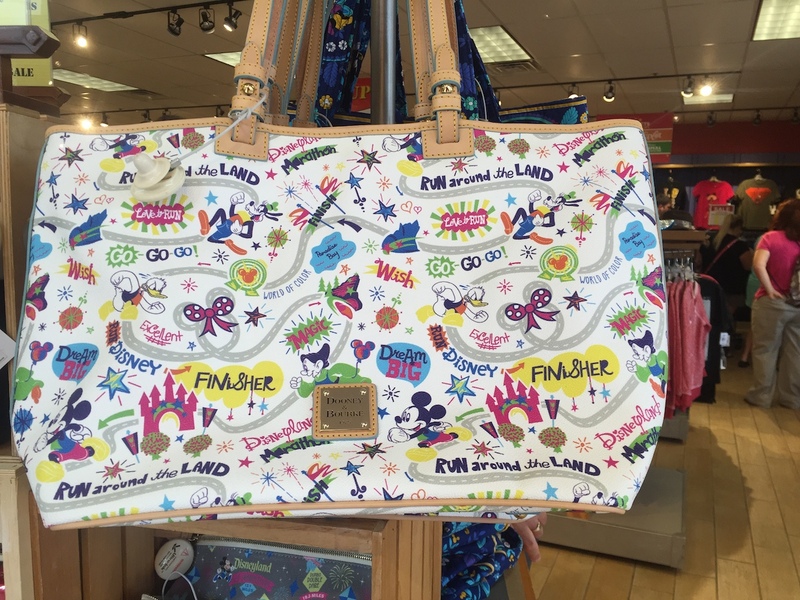 This Vera Bradley bag was originally $105, but reduced to $69.99. 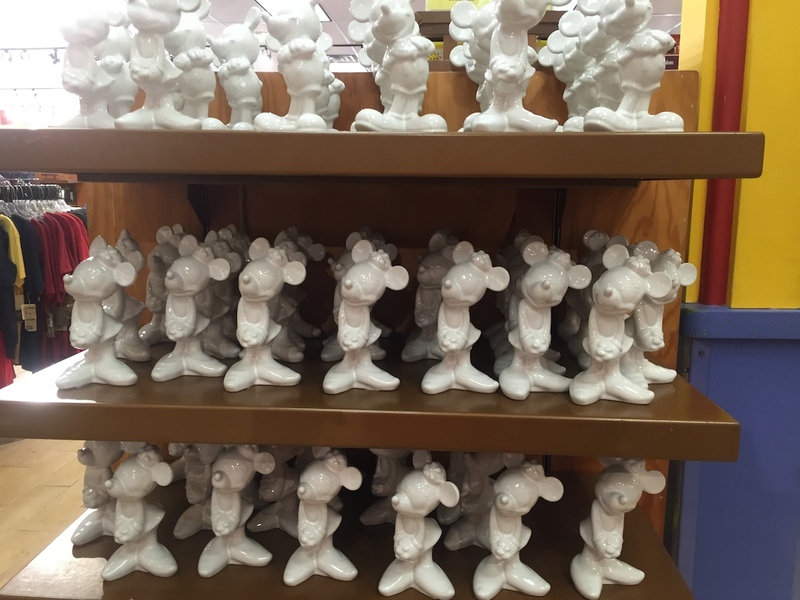 I don’t understand the appeal of these white Mickey Mouse (originally $21.95, now $12.99) and Minnie (originally $21.95, now $8.99), but I was just at World of Disney in Disney Springs and it had more white ceramic characters including Mr. Toad. I’m not sure what you are supposed to use these for other than to smash on the floor for dramatic effect in an argument with your significant other. A more conventional, articulated, Mickey Mouse toy. Originally $7.95, now $3.99. 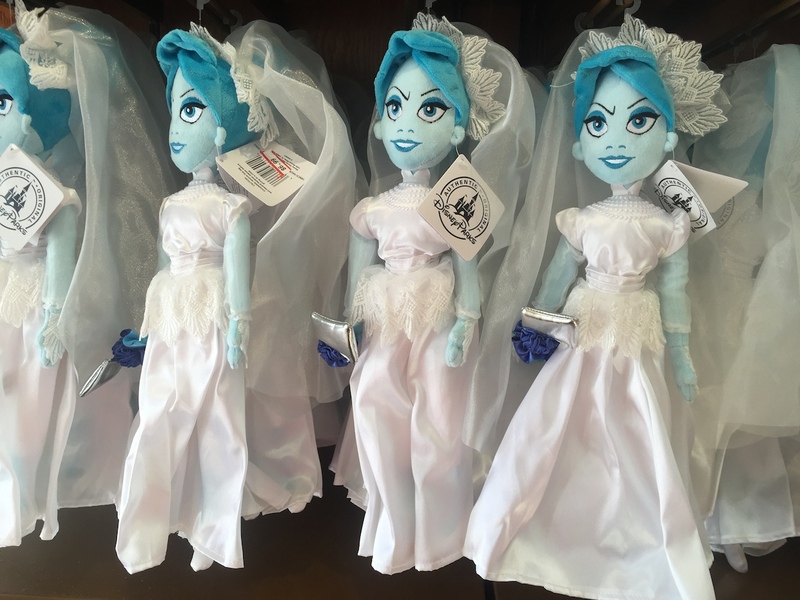 A Haunted Mansion Bride plush marked down to $6.99. I think this next level bananas plush is a Pirate Dog. Marked down to $9.99. 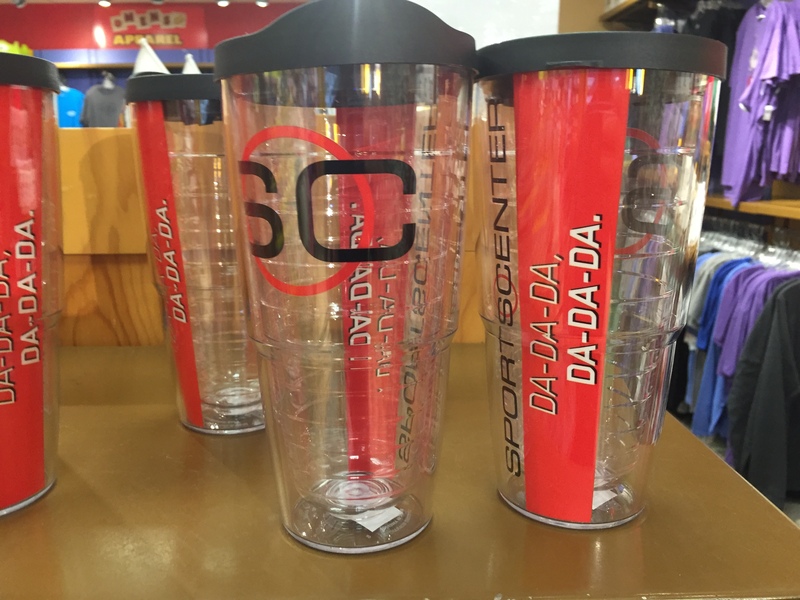 Lots of sports items this month including a ESPN SportsCenter cup that was originally $24.95, marked down to $9.99. In case you missed Disney burying the news late on Thanksgiving Eve, ESPN has lost millions of subscribers, so these cups are probably being filled to the brim with Jack & Coke as Disney execs figure out to fix what was not long ago a true golden goose for the company. Cups like this aren’t helping ESPN’s bottom line. Here’s a cute little bowling set. 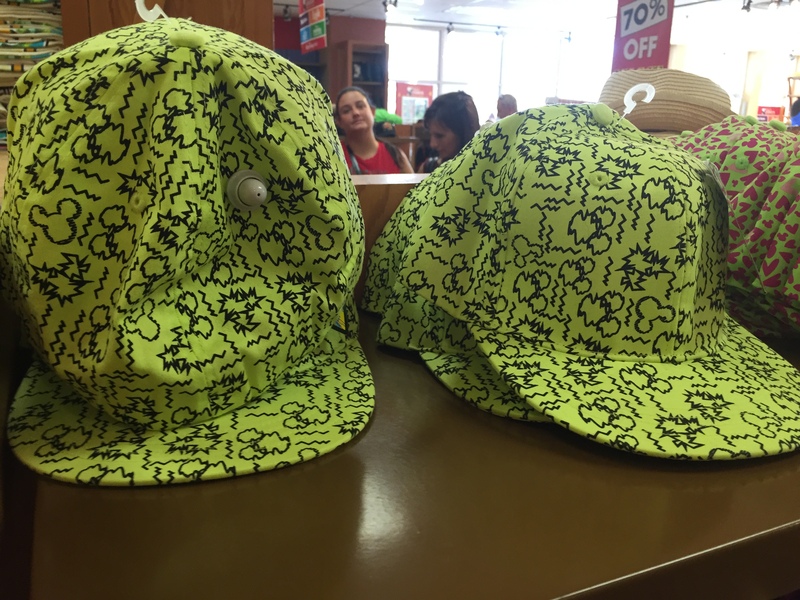 Originally $17.95, marked down to $9.99. We are really using the phrase “signature series” loosely at this point. 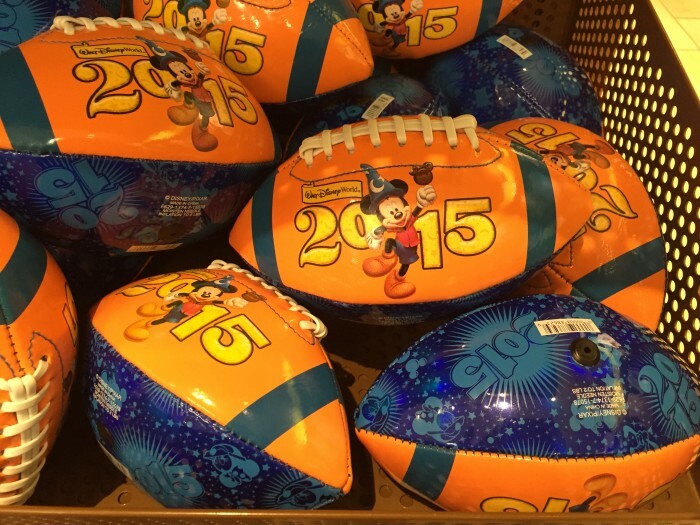 These 2015 footballs were originally $11.95, marked down to $4.99. These are great for the pool too. The 2015 basketballs were also originally $11.95, but only reduced to $7.95. I’m not sure where this light up Perfectly Princess Birthday Party Cinderella coach necklaces came from. Anyone have an idea? Marked down to $3.99. I just realized I’d probably lose my voice on Day Two of my job after walking through the Antenna Topper division. This is great. 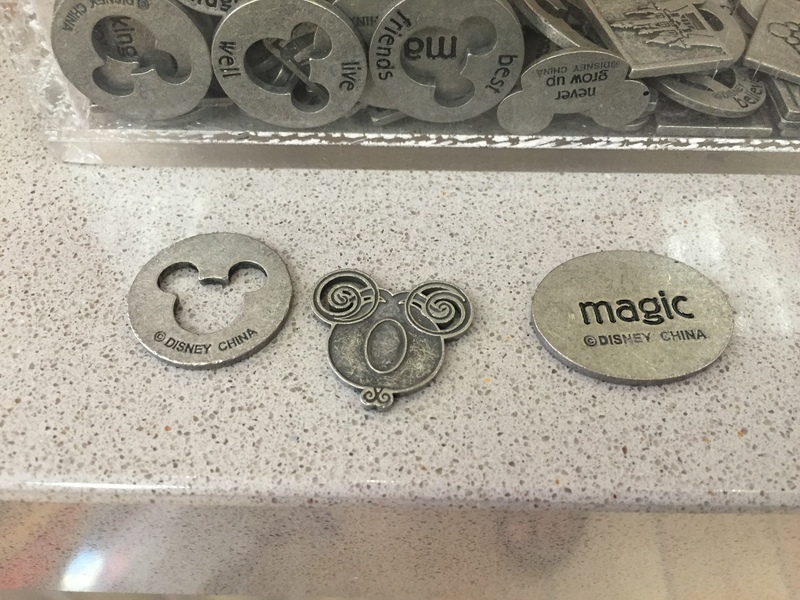 I thought these Pieces of Magic were pretty neat and only $1.95 each, so I bought a couple. 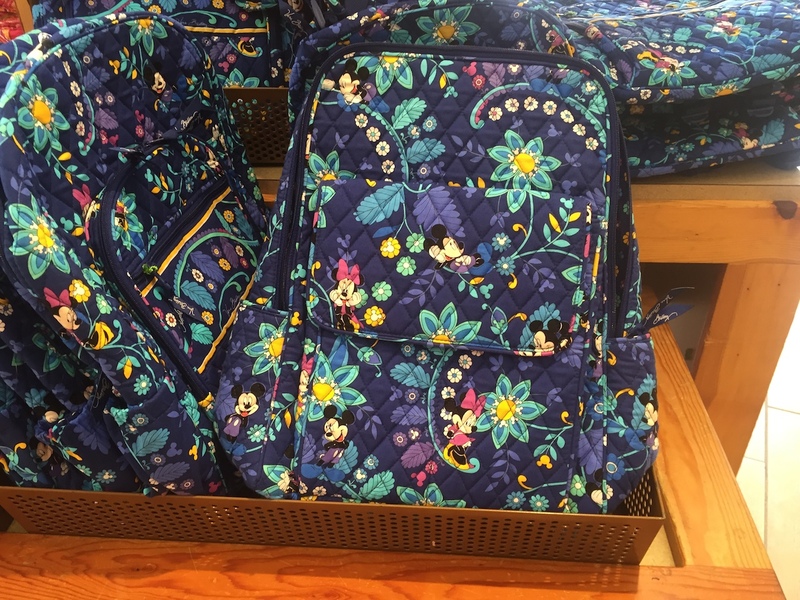 Then I go to World of Disney this week, and they are being sold new at “6 for $10.” That’s right, these went to the Outlet store AND WENT UP IN PRICE. 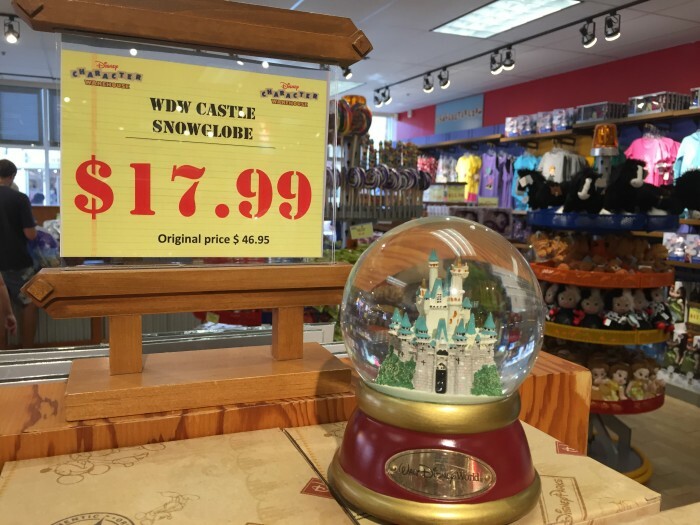 Thanks to the TSA, I bet sales of snowglobes in Orlando are down a conservative 2,000,000%. We mentioned these Mickey face backpacks last month and we’ve heard from several readers that these are possibly the worst quality backpacks ever made. So buyer beware. Okay, let’s finish up with some clothes. 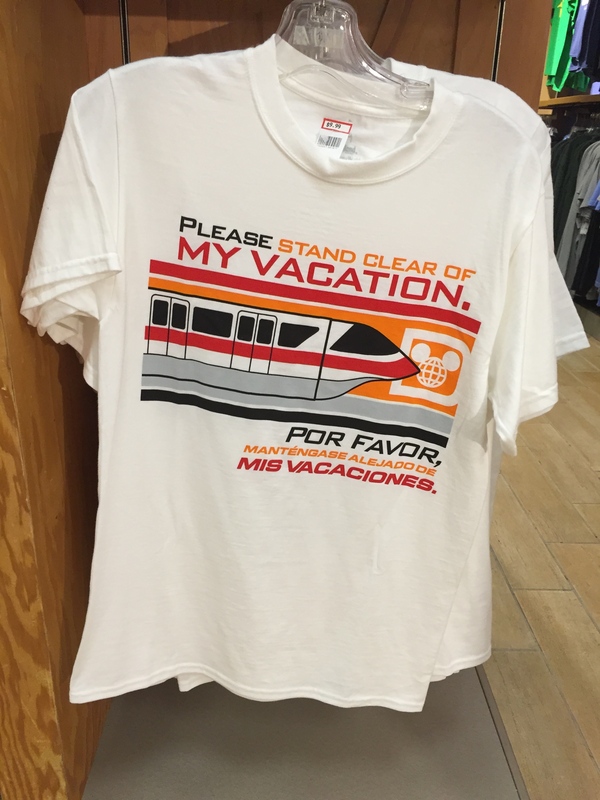 First up, a kinda weird Monorail shirt. Originally $21.95, now $9.99. Seems like more of a Shelbyville shirt. 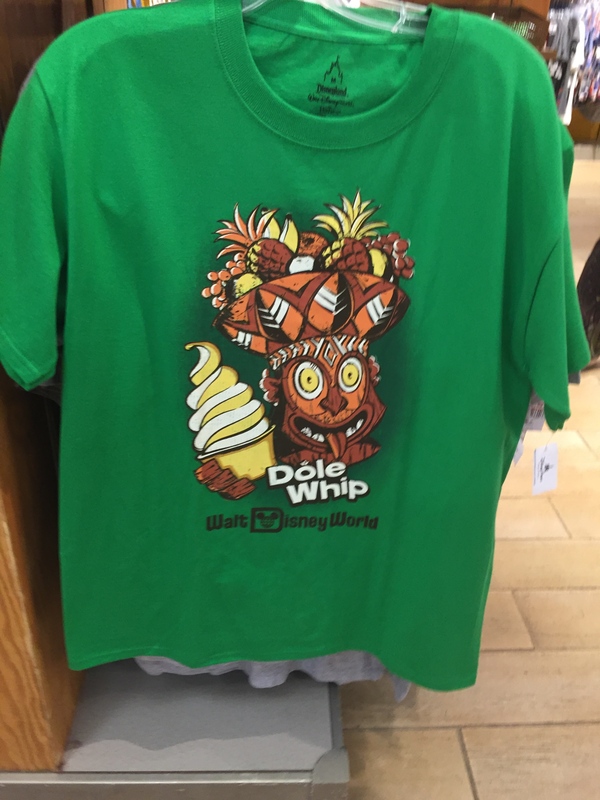 Here’s a Dole Whip shirt. Also $21.95, also marked down to $9.99. This is why I’m a Citrus Swirl guy. Better merch. 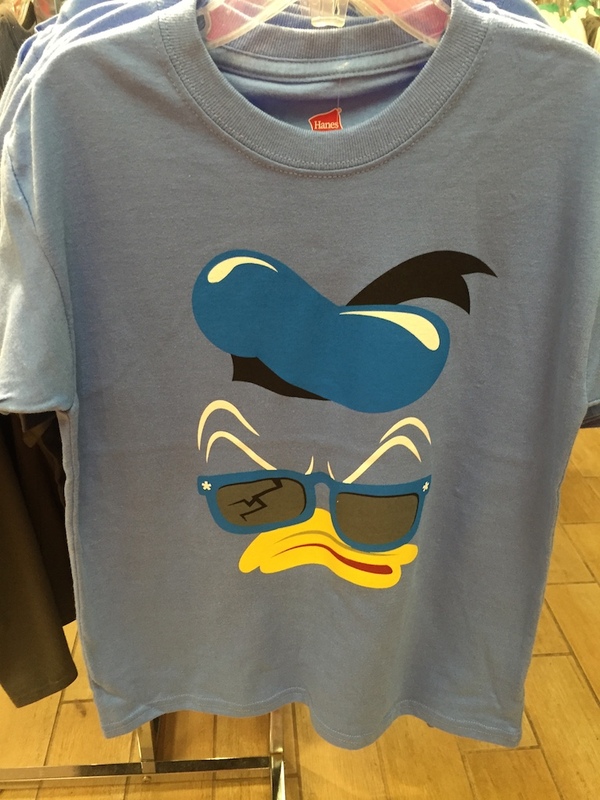 I don’t understand this Donald Duck shirt. Why is their a crack in his sunglasses? What am I missing?!!!!! Originally $19.95, reduced to $9.99. Here’s a shirt I can get behind. 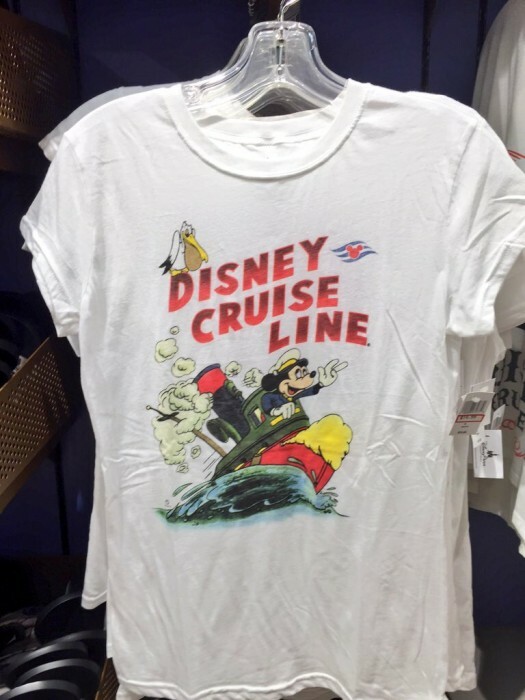 A cute Disney Cruise Line one that was originally $39.95 marked down to $12.99. I also like this one a lot. Originally $39.95, marked down to $16.99. 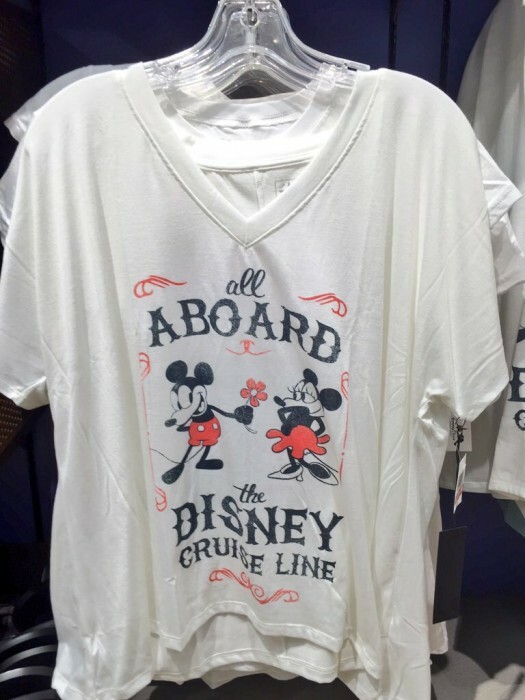 In case you were late to the party, the average Disney Cruise Line merchandise is at least twice as good as our average WDW item. Here is another fun shirt, originally $24.95, now $14.99. 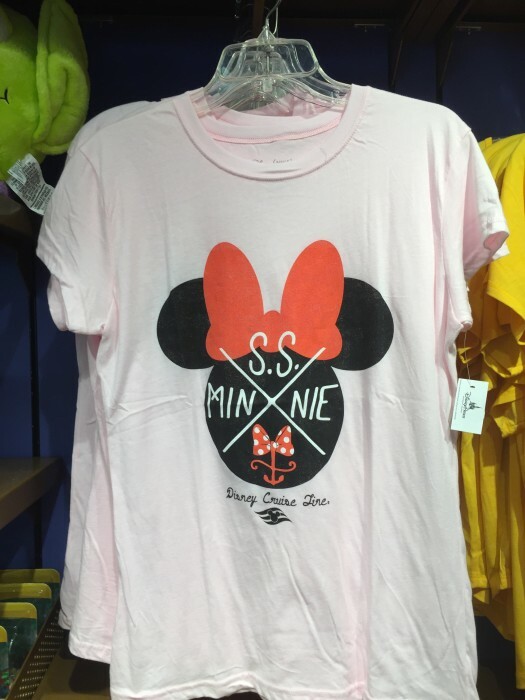 S.S. Minnie shirt. Originally $24.95, now $14.99. Loved this young child’s DCL shirt. Originally $29.95, marked down to just $6.99. Another cute one. $19.95 reduced to $9.99. 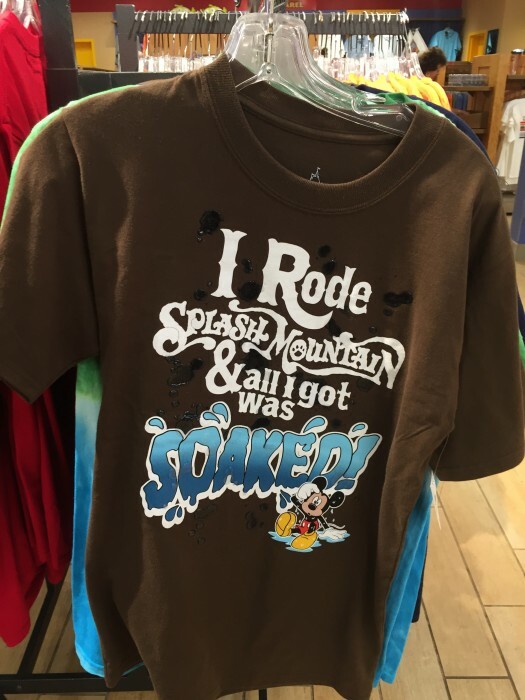 How can you not love Splash Mountain? 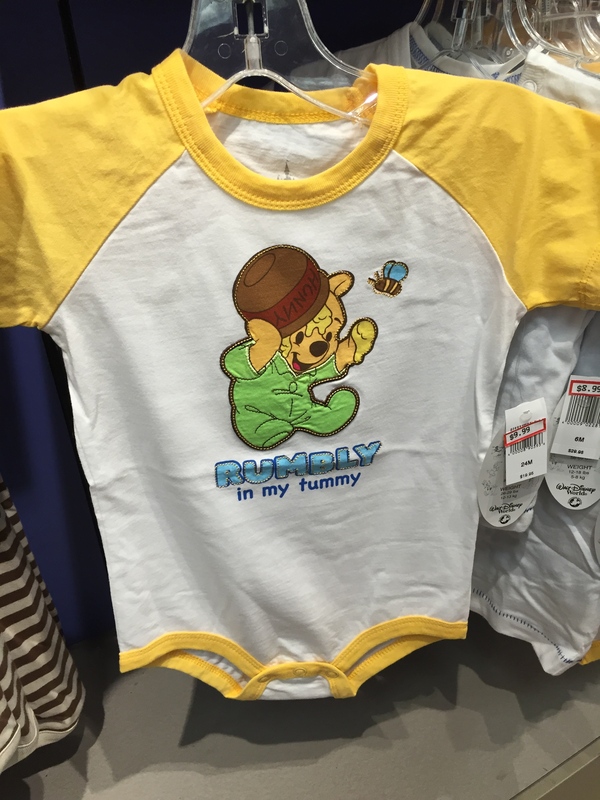 This shirt was originally $32.95, marked down to $14.99. Ugh. 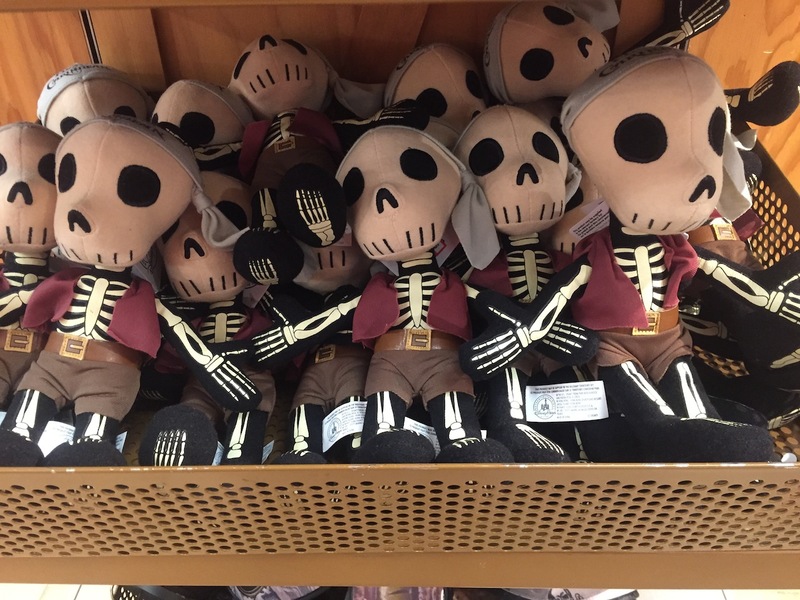 Originally $24.95, marked down to $12.99. 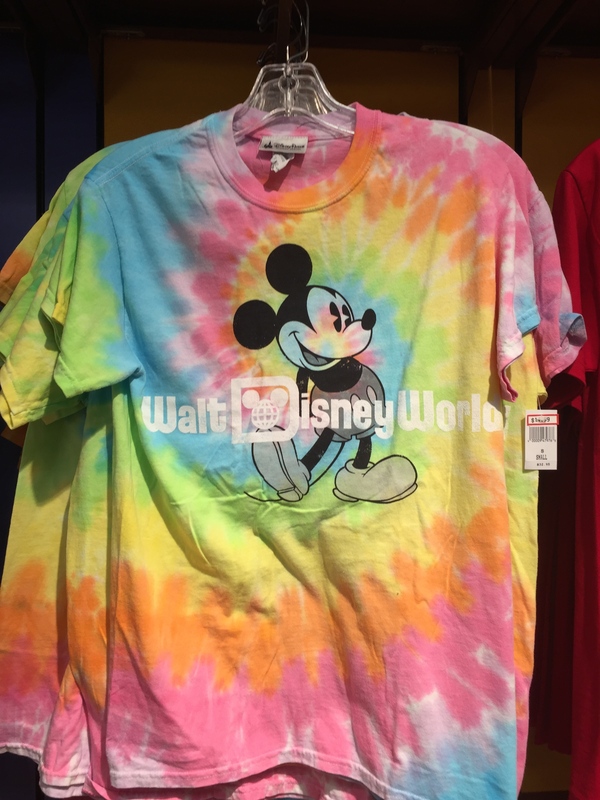 I’ve never been a huge fan of tye dye shirts, but I can also see why people like them. This Mickey shirt was originally $32.95, marked down to $14.99. 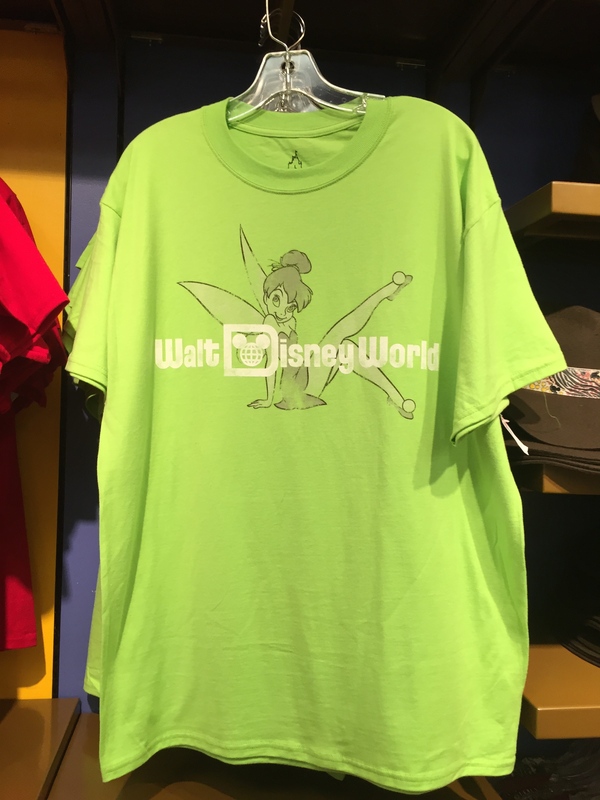 These Minnie Mouse and Tinker Bell shirts were originally $21.95, reduced to $9.99, but probably would have looked better in a women’s cut. 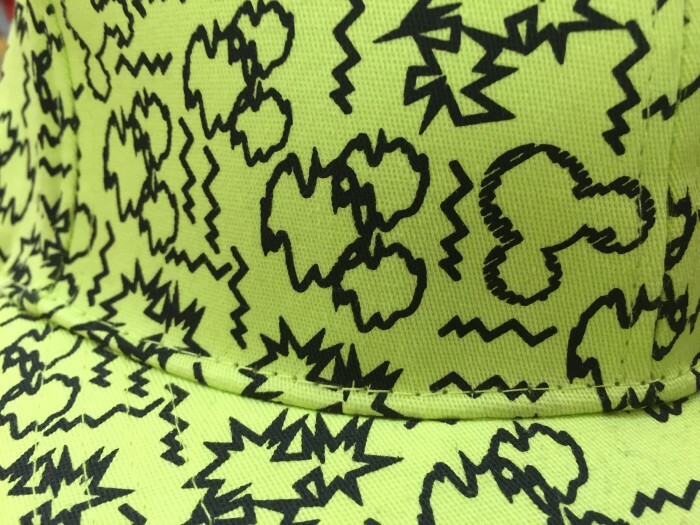 Have to close with this completely bonkers hat. I feel like I’m having an epileptic seizure just looking at it. 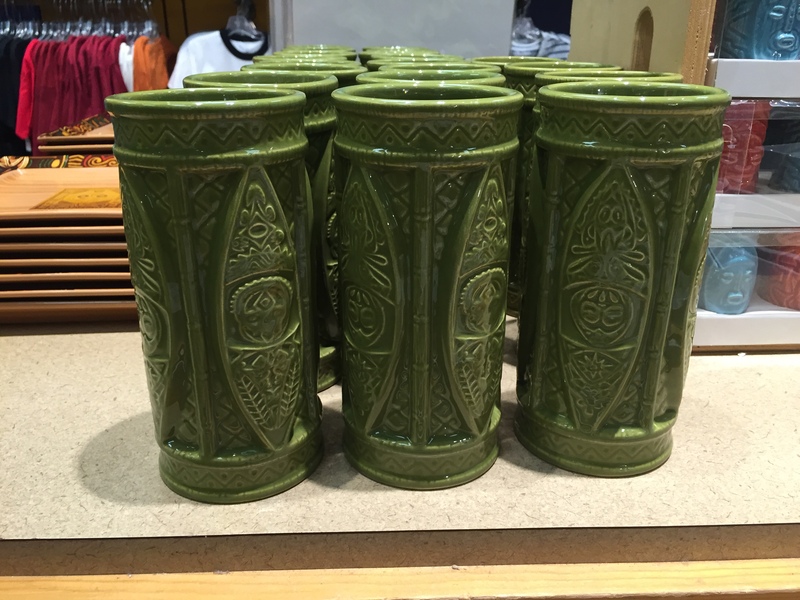 Originally $24.95, marked down to $14.99. I didn’t ask, but if you buy a hat like this I bet you get a free bowl of soup. 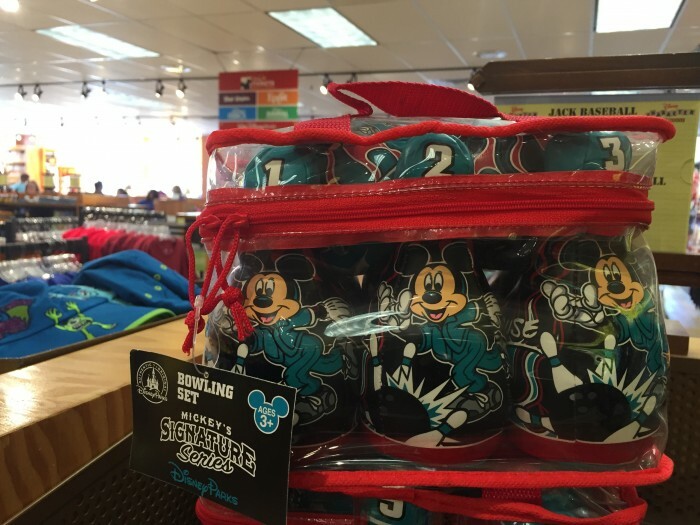 There are actually two Disney outlet stores in Orlando. Both are in Orlando Premium Outlet shopping complexes, and they are called Disney’s Character Warehouse, presumably because The Land Of Misfit Toys was already trademarked. There is one Character Warehouse located on International Drive close to Universal Studios (4951 International Dr, Orlando, FL 32819), and the other is on Vineland Avenue, right across I-4 near the exits to Disney World (8200 Vineland Ave, Orlando, FL 32821). For this edition of MMM, we went to the location near Universal and the one near Disney. NOTE THAT THE I-4 LOCATION IS CLOSED UNTIL “Hopefully by the holidays” FOR A REFURBISHMENT. I get a lot of questions about this, so we’ll answer them here. 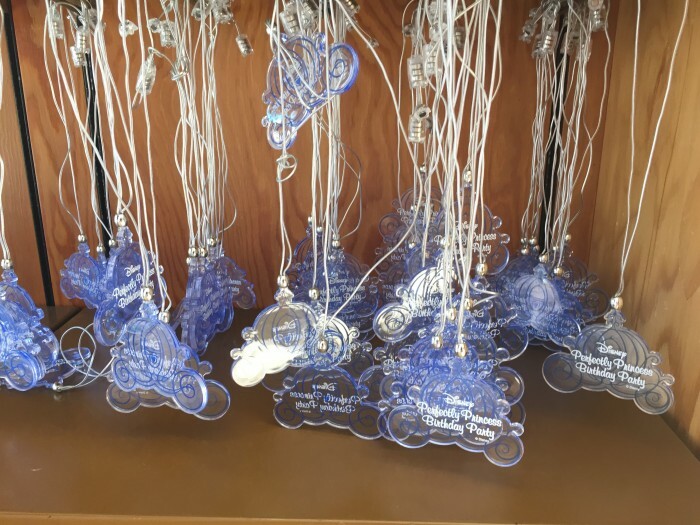 You can order any item from the Disney Outlet Stores by calling the WDW Merchandise Guest Services (877-560-6477) There is a catch though, if the item is still available they will charge you full retail price for it, plus shipping. The Outlet Stores themselves do not ship merchandise. Previous editions of Magic, Memories, and Merch: July 2013, August 2013, September 2013, October 2013, November 2013, December 2013, January 2014, February 2014, March 2014, April 2014, May 2014, June 2014, July 2014, August 2014, September 2014, October 2014, November 2014, December 2015, January 2015, February 2015, March 2015, April 2015, May 2015. June 2015, July 2015, August 2015, September 2015, and October 2015. We also did an edition of Magic, Memories, and Junk for a non-Disney owned Outlet Store, and for you merch addicts like myself, you may also enjoy a look at the official Disney merchandise available on the Disney Cruise Line, Castaway Cay, and at the Orlando International Airport. 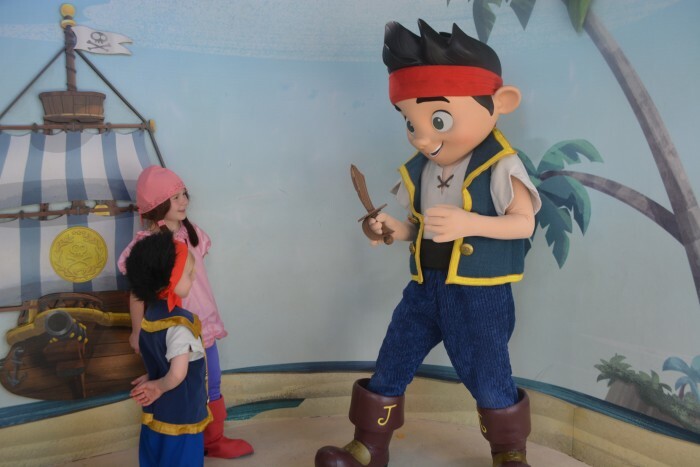 If you liked what you read here, you may enjoy THE SATURDAY SIX articles every week on the TouringPlans.com blog, the Pardon the Pixie Dust podcast, and you can follow your humble author on Twitter (@derekbugan). Love these posts. 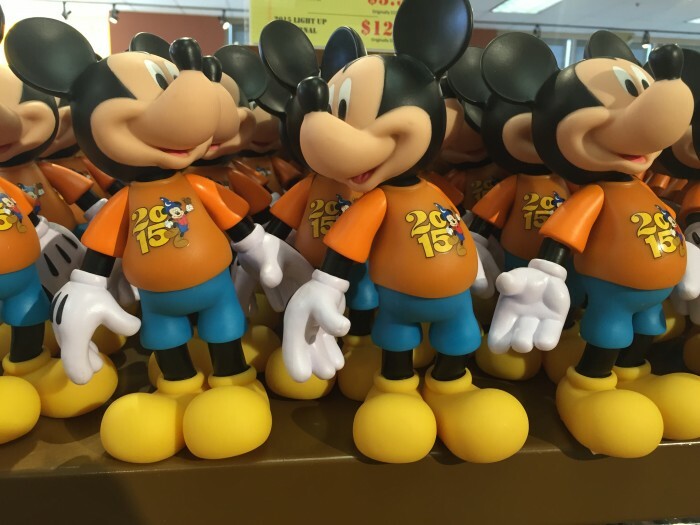 Was the orange bird ceramic figure from last outlet run still there? Also, any new muppets stuff? Thanks! No orange bird and no Muppets. I would definitely post pics of them as I love the Muppets. I don’t like people buying up tons of merch either (for resale probably ). 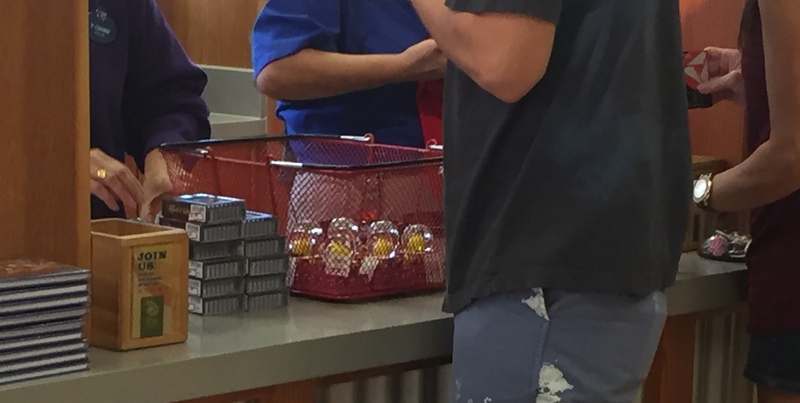 But taking pictures of their checkout is creepy. Given this and the narrative (spy) camera blog where Erin Foster videoed an unsuspecting cast member (I urged it be removed and it was), you folks at TP ought to seriously discuss photo ethics. No one has an expectation of privacy at Disney or other public venues, but targeting others even anonymously, seems inappropriate. Not sure I see the problem, given that the person in question is in no way identifiable in either of the pictures (unlike the spy camera photo of a cast member). How does a picture that does not include someone’s face consist of “targeting others anonymously”? Would it have been different if the incident and total were just mentioned in the text, with no pictures? How? Not trying to be abrasive, I’m just trying to understand where you are coming from on this. Thanks for the comment Roger. I’m not sure how much of my work you read/follow, but I’m pretty serious about never using any people in my photos unless it absolutely can’t be avoided. I’ll walk over to other areas of the store with an item, wait for an extended time, etc, just about anything to ensure people aren’t in the shot. There is no bigger fan of people’s privacy than me and I hope that I am responsbile in my articles. This particular case struck a nerve with me. Again, I’m not sure how much you have read my previous work, but people who buy out a bunch of stuff before anyone else gets a chance to look at it really sticks in my craw. And not just at the Outlet. It probably shouldn’t, and I understand the defense of “CAPITALISM 101.” I did everything I could to make sure no one could identify the person I took the picture of, but I did want to show readers what I have been talking about for the last several years. I never saw this type of behavior at the Outlet store off of I-Drive, only when I started coming to Vineland more often. Not saying it didn’t happen, but I didnt see it, and I pretty much have to see it every trip now. I definitely appreciate being called out for things which may appear to cross the line. After reading your comment I approached several people I trust and asked their opinion. Sometimes I can be too close to something to make an objective decision on it. I appreciate your response. Your blog posts are great and I enjoy them immensely. Two comments: as for the person buying hundreds of dollars of stuff at the outlet, he or she should be called out on it. But a blog post is fairly removed from the incident. A more direct statement can be achieved by calling out the person directly. While this is doable, I can attest from personal experience at a Macy’s, that it is not popular with the customer bagging up tens of Tommy Bahama shirts or the cashier. But a point was made. As for the camera issue, no personal info was revealed. With all the issues regarding credit card security now, taking photos of someone else’s transaction (even without a human in the pic) strikes me as something that should be avoided. I suppose you could ask the customer if you could take a photo during the checkout process. But if you didn’t get permission and took the photo anyway and were confronted by the customer, then you may be unable to take more pictures without enduring a colonoscopy first. Use discretion. Great comment. I think folks need to think long and hard about what is and is not out of bounds with this stuff. In this specific case, I think a reasonable policy would allow Derek to post the story as is. First, to reiterate what you said in your comment, there is zero expectation of privacy in public spaces. I’d even go as far to say that eBay scalpers like the gentleman pictured should expect to be photographed when making bulk purchases of this sort. 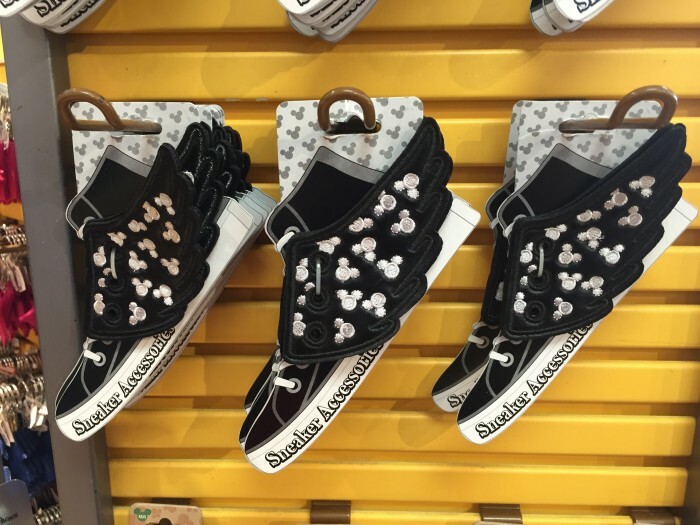 It has become quite commonplace for these transactions or the purchasers to be photographed and for those photos to be shared on Twitter or Facebook. Second, steps were taken, probably as a courtesy, to protect the purchaser’s identity. It looks like Derek intentionally cropped the photo to avoid sharing his face. That strikes me as pretty fair. Philosophically, I think it is important that we do all we can within the law to shame this type of behavior. Hoarding like this is terrible for consumers. 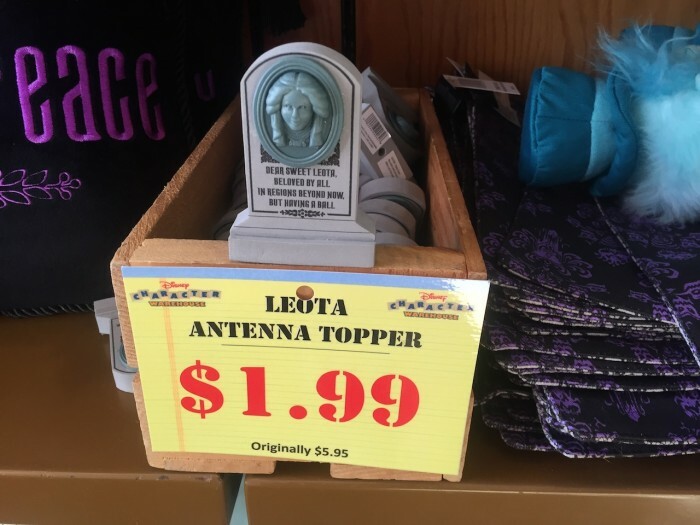 Disney has decided that this is something they aren’t going to regulate. If shaming of people who do this discourages this behavior, it is a good thing. This isn’t about shaming other guests. It’s about shining a spotlight on those running de facto businesses that rip off consumers with the fake scarcity they create themselves. Now we just need Derek to give Universal a Turkey next year. How about we comprimise and give SKYPLEX a turkey? I’ll bookend this by saying I’m not a lawyer…. Back when I was taking the required ethics in journalism classes in the dark ages, one of the topics discussed was photographing people. In short, you are able to photograph any person in a public place (which includes being in a public store, restaurant, etc.) as long as there is not a reasonable expectation of privacy. So taking a picture of someone in a store — Okay. Taking a picture of someone in the dressing room of the store — Not okay. In my class, it was also stressed that unless you are paid paparazzi (where you go by a whole ‘nother set of “ethics”), if someone asks you not to take their picture, it’s generally the polite thing to do to avoid taking the picture, even though you legally have the right. Now, even with that, if an identifiable photo of the individual was posted with commentary that had libel issues (for instance, saying that this guy was going to sell stuff on eBay at a 10x markup), that would be its own problems — unless the author of the statement had physical proof to back that up. But a photo that does not identify a person and doesn’t make any claims about the person’s activities that are not supported by evidence on the spot — I personally don’t see a problem with it. At 6 for $10, the Pieces of Eight are $1.67 each at the outlet, which is actually a slight discount over $1.99 each. I think my mom has some old white ceramic figures from long, long ago … WDW Village era. 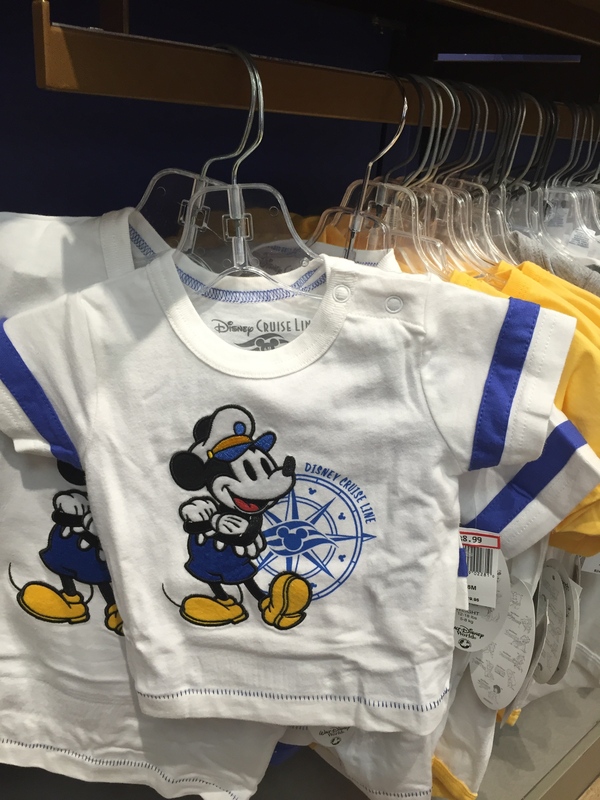 I gues like the basic Mickey shirt, they tried some retro product. I think basic reporting is not creepy. Public areas are public areas; trying to make it otherwise is creepy. Finally, that monorail t-shirt is a design based on one used on coffee mugs and chocolate. I don’t know why, but “please stand clear” seemed more fun to me when defending my candy and caffeine. The Outlet didn’t have the 6 for $10 deal. That was at World of Disney in Disney Springs. Outlet had them for $1.95 each. 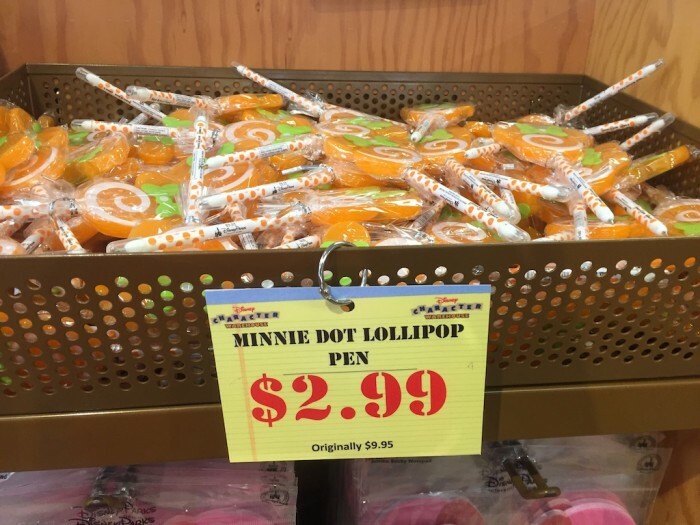 There was a Disney outlet opened at the new Tampa Outlet mall. Do you know if it ta the same type of outlet with discounted Disney park items or is it just s Disney store outlet? I brought the Mickey face backpack and for $6 wasn’t expecting anything amazing. I’ve taken it on a couple of daytrips so far and it’s held up well though! Reminder to check out disney parks app daily deals. Some cool stuff but some odd things too. I hear Derek Burgan in my head as a scroll down. Your comment about the white ceramic figurines made me LOL! Thank you, Derek, for making Thanksgiving Week a most wonderful week of excellent, humorous columns. To reference The Beatles and Caddyshack…as I’ve said before, MST3K has nothing on you. Please keep up the great work! Thanksgiving week is like my Super Bowl and May Sweeps rolled into one. 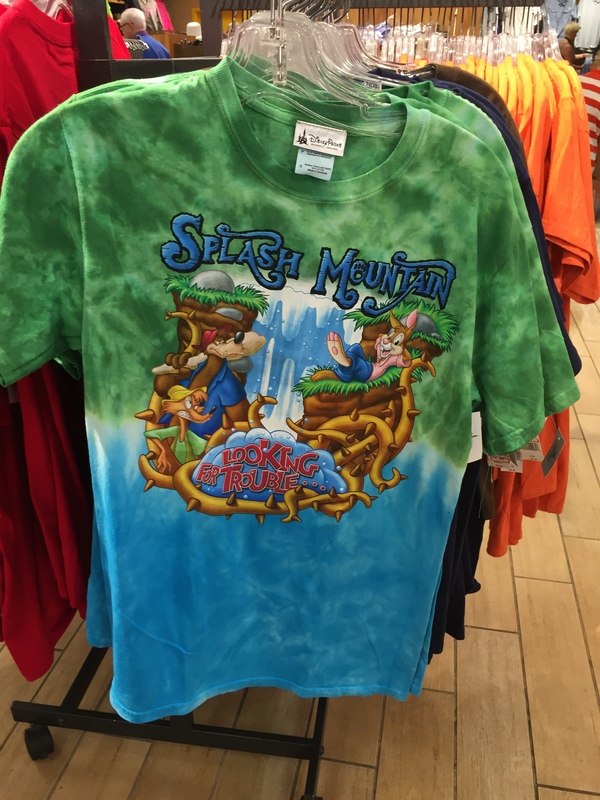 Those Splash Mountain shirts remind me…do they still sell those shirts for the ride that say, “Dry is not an option” on the back? Yo Homes! To Bel Air, err, Disney World. Has anyone seen the Buzz Lightyear Adult Hoodie there lately? I wish Vineland would put a 5-per item limit like iDrive had. I never really understood why that was in place until I was forced to go to Vineland and got to experience the Merch Jerks (love that TP-coined term, btw)first hand. I literally had my hand extended to pick up an item and had a MJ come and grab all of the items off the shelf. I very pointedly looked at her and said “good thing no one else wanted any of those,” to which I got a “humph.” I know these people are just trying to make money, but it is very frustrating. That’s a good point. While I didn’t mention it in my rant, I-Drive has signs with purchase limits. I wonder why they did and Vineland doesn’t? And did that have any factor to due with the store not being anywhere near as busy as I-Drive. The Monorail shirt: Our son has one. Two actually, the other has a less angular design. They’re cool, like bow ties, but with more monorail. If they made one of those shirts and integrated the audio of Jack Wagner I would wear it! And I wonder if Donald’s cracked glasses are like Michael Douglas in “Falling Down”? That would immediately move the shirt from my Six Worst Made to the Six Best Made list. Is the International Drive location reopened yet? Not as of two days ago. (Nov 30) Will be checking again this week.